Often dubbed as the 'Fort city of Rajasthan', Chittorgarh is renowned for its cultural as well as historical significance. This historical city of Rajasthan is home to the India's biggest fort, the Chittorgarh Fort. Chittorgarh is thronged by tourists not only because it an important tourist destination but also for being a popular shopping center of Rajasthan. There are a number of shopping areas in Chittogarh. However, Fort Road Market in Chittorgarh stands apart from the rest owing to the availability of diversified items and products. Chittorgarh Fort Market is a thriving shopping area of this city. It is visited by a large number of tourists both from India and from various parts of the world. There are numerous shops dotting this market area. The shops make a wide display of their spectacular collection of both traditional and contemporary Rajasthani goods and items. Two of the most popular items sold in the shops of Fort Road Market are metal ware and fabrics. 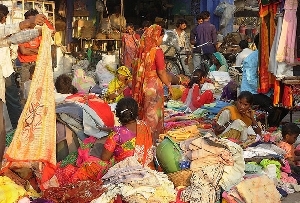 The Akola fabrics in general are sold like hot cakes in this market. These beautiful fabrics are made by using vegetable dyes. The products of Akola fabrics are preferred mainly by foreign tourists. Fort Road Market also makes a wonderful display of painted toys made from wood. Mainly belonging to Bassi Village, these toys perfectly showcase the artistic talent of the skilful craftsmen of Rajasthan. In addition to these, shoes, locally known as 'juits', are hot favorite among the tourists. Made from camel leather, these jutis are attractive, colorful and flashy and are famous all over the world. The intricate embroidery works on the jutis are an added attraction. One of the best buys from this market of Chittorgarh is the works of Thewa jewelry. Hailing from Pratapgarh in Rajasthan, the works of Thewa jewelry are both attractive and beautiful. A must buy mainly by the women tourists; Thewa jewelry is reflective of the rich culture of the state of Rajasthan. Thewa jewelry is found in almost all the shops of Chittorgarh Fort Road Market. Rajasthani handicrafts items are found abundantly in the various shops of this popular market. These handicraft items are sold like hot cakes in Fort Road Market. In fact, without buying these beautiful handicrafts goods and item, shopping in Fort Road Market is incomplete. Tourists buy these items as souvenirs or memento. Though tourists can hardly resist themselves from shopping in this market, those who are not fond of shopping can take a walk along the lanes of Fort Road Market. Tourists can enjoy the charm of this bustling bazaar of Chittorgarh. 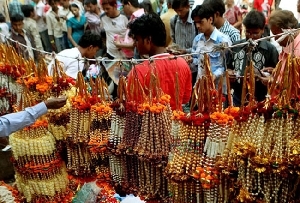 The varied range of items and products found in the shops of this bazaar are not found anywhere else in India and also throughout the world. While on a tour to Chittorgarh, a visit to Fort Road Market is must.